Since our inception in 1965, EB Industries has always operated using the highest quality standards available. The traditional leader in dictating standards is the aerospace industry. It is easy to understand why: a problem with an aerospace part can result in a catastrophe. Adhering to strict standards ensures that part fabrication and finished products meet requirements, and that component construction is repeatable and of high quality. Over time, standards expand and improve, and EB Industries’ operations evolve to keep pace. Becoming certified for a standard is typically an arduous process which requires inspections and audits that can take months or years to complete. Every part and weld we work on conforms to practical, recognized standards, including NADCAP, AWS, AMS, ISO 9001, and AS9100. Our full list of certifications is even more significant since we also meet the proprietary standards of many top-tier manufacturing organizations across multiple industries, such as Lockheed Martin, Northrup/Grumman, NASA, Stryker, Zimmer Biomet, Applied Materials, and L3. Even if compliance with aerospace standards seems beyond the scope of your project, there are distinct advantages to having your parts welded by EB Industries. This article examines the ramifications and benefits of working specifically to the AS9100 standard, and how that benefits all of EB Industries’ clients. C7. 1, C7. 2, and C7. 3 are excellent guides for weld design and also describe the nuances of the welding technologies used. However, D17. 1 is the most important guideline relative to controlling the welding process because it specifies the processes that must be followed including training, qualification, cleaning, and inspection requirements. Electron beam and laser welding are both covered by D17.1 since both processes are considered fusion welding. All of EB Industries’ welding procedures are designed to conform with D17. 1, performing to that absolute standard at a minimum regardless of the industrial sector for which a part is fabricated. Surprisingly, AWS has not published fusion welding process standards for any other industry sector including medical and automotive. We have found that some large organizations have their own standards, and many of these proprietary standards reference AWS D17.1. The AWS standards are excellent for process assurance, but they do not prescribe the control structure to assure the standards are applied consistently by an organization. This is where standards ISO 9001 and AS9100 become so important. ISO 9001 (International Organization for Standardization 9001) is an international standard that helps gauge the quality and competency of suppliers. The ISO is an agency which develops and publishes standards recognized by more than 160 countries. ISO 9001 is important because it outlines requirements for a quality management systems. These guidelines ensure that a company’s product or service meets the needs of customers and stakeholders. ISO 9001 also also ensures compliance with some statutory and regulatory requirements. EB Industries is certified to ISO 9001:2015, the latest version of this sweeping standard, substantially enhanced from previous versions. AS9100 (Aerospace Management Systems 9100) is based on ISO 9001 but takes it to an even higher level, expanding the scope to satisfy additional DoD, NASA, and FAA requirements and quality controls. 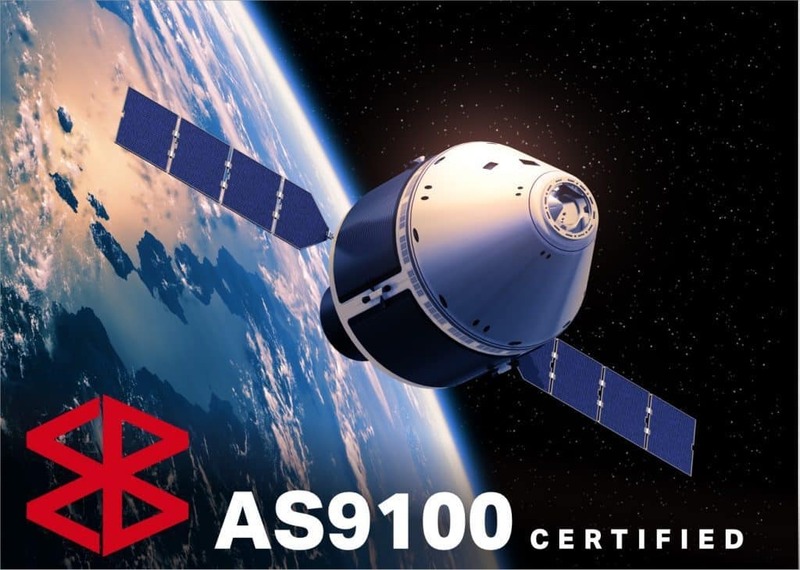 AS9100 certification means that all EB Industries’ services are backed by a certified quality management system designed to meet the rigorous requirements of the Aerospace and Defense Industries. The most visible benefit of AS9100 to anyone fabricating assemblies is in the standard’s production and service provision sections. A visit to the Boeing factory in Seattle, Washington, communicates the true scope and power of AS9100. Millions of parts need to show up on time and be of perfect quality to make an aircraft. AS9100 controls provide a structure to assure requirements are applied consistently and are constantly monitored for every supplier in the supply chain. This is especially important for welding, as it is a manufacturing process which innately has variation. This is one of the reasons AWS D17.1 was created. The guidelines ensure that the manufacturing process inputs, the welding process itself, and the outputs cannot cause problems of unimaginable proportion further down the supply chain. Any industry benefits from this monitoring and control. Additionally, AS9100 provides guidelines in the area of purchasing, purchased parts and supplier control. Understanding why this is so critical requires understanding the three main problems we find in welding: material, fit-up, and cleanliness. For example, if a material supplier isn’t reputable or doesn’t have tight controls, alloys can get switched. Due to a higher carbon content, 316 stainless steel is much more crack sensitive than 316L. If 316 alloy is switched for 316L, sub-components might need to be completely scrapped or the welding process completely redeveloped. This may cause delays and increased costs. Fit-up can make a huge difference in a weld. If a machining operation adds a chamfer that was not originally on a part, the weld can fail. Finally, poor cleaning and improper plating can contaminate parts and have a huge impact on a weld. The controls in AS9100 help make sure sub-components are authentic, that they are manufactured to print specifications, and that they are properly prepared for welding. Project management, risk management, configuration management, and control of work transferred between facilities and suppliers are other areas where AS9100 has a big impact. Often electron beam or laser welding is performed as an outside special process because obtaining the requisite equipment and expertise can be cost-prohibitive for a manufacturer. This outsourcing means that there needs to be significant coordination between all parties — customer, welder, sub-component fabricator, cleaner, etc. — during the development of the initial welding solution as well as during the eventual production process. Project management is critical during development where any change in design of a sub-component can have a ripple effect causing project delays and cost overruns up and down the supply chain. During production, configuration management can have significant impact on downstream processes such as welding. Finally, risk management impacts all process, projects, and programs by methodically determining possible areas of risk, and steps that can be taken to minimize such risks. It is important to note that there are other quality standards, both in the public domain and privately maintained, that have different requirements from AS9100. The most notably is ISO Standard 13485, which governs the quality management system requirements for the design and manufacture of medical devices. The details of this standard are not the within the scope of this article. but may be the subject of a future article. Suffice it to say that AS9100 and ISO 13485 have many similarities but a few important distinctions. Fortunately, EB Industries has always handled parts and assemblies for a large number customers from a wide array of industries. As a result, our quality management system evolved to identify, document, and control these differences. If your company is in the aerospace sector, you understand AS9100 as a necessity. If your company isn’t in aerospace, the standards are a value added benefit. Every part EB Industries works on — whether it is going in a car, a sensor, a battery, a pump, a valve assembly, or a human hip — is handled and fabricated according to the same processes and procedures that ensure aircraft fly or space craft launch successfully. Because our entire operation is compliant with AS9100, you intrinsically receive the benefit of the highest possible quality regardless of price. The bottom line for EB Industries’ customers is that we carry on a tradition of excellence that was established at the company’s inception in 1965. Whether or not your industry demands such quality standards, they are always part of the EB Industries client experience.